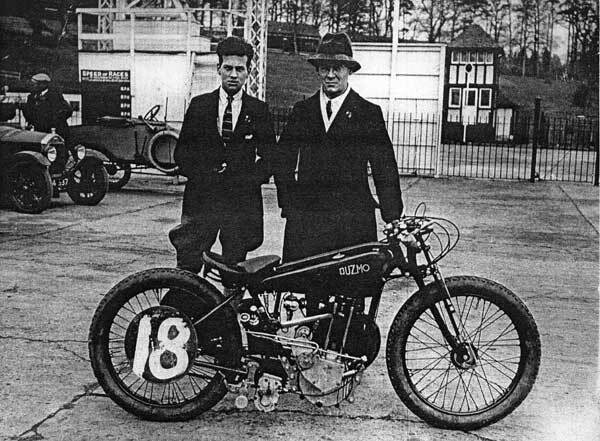 Wallace & Biggs at Brooklands on 6th May 1922. 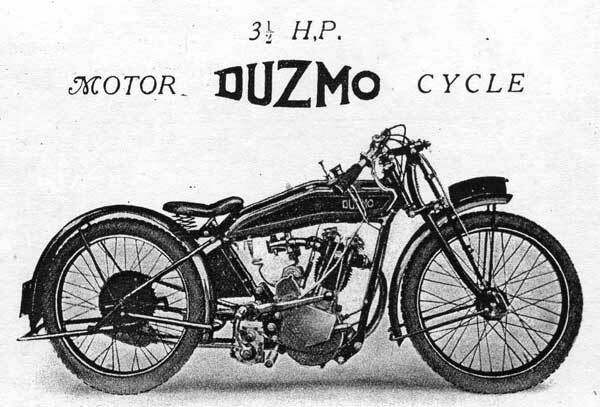 Duzmo Motorcycles were started in late 1919 by the partnership of John Wallace, chief designer and the Portable Tool & Engineering Company of Enfield Highway. Most of their engines were built under contract by the Advance Motor Manufacturing Company of Northampton. John Wallace was born in 1896 and attended Askes Grammer School. Wallace had no formal training as an engineer, but was determined to be one. After he went to a motorcycle exhibition in 1911, Wallace decide to build a motorcycle. He had bought a set of un-machined engine castings for £2 10 shillings, and proceeded to equip a workshop in his father's garden. Next was to teach himself to use the machinery, but soon realised that machining the castings was beyond the machinery and his ability. So he bought a frame and wheels from a local cycle maker and a secondhand engine, to produce a motorcycle which he promptly sold. After leaving school early in 1912, his father wanted him to join the family firm of clothing producers, but John got his way and landed an apprenticeship with Collier & Sons of Matchless fame. After an accident at the factory John's father put a stop to his employment with the Collier's . The pill was sweetened by his father buying him and his brother a pair if TT Rudges. They both swiftly joined the British Motor Cycle Racing Club and started a racing career at Brooklands. However things did not go well and John's Rudge was damaged beyond repair. 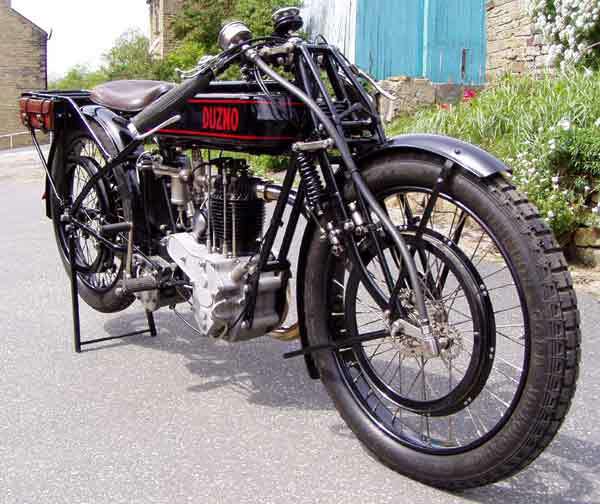 So early in 1913 he started as an experimental department test rider for J.A. Prestwich of which testing at Brooklands was required until the firm became aware of his age and promptly sacked him. Wallace then spent the rest of the time up until the end of 1914 studying engineering and training to become as draftsman. With the onset of war Wallace decided that there would be little demand for motorcycles, so he took a job at Scottish car makers, Arrol-Johnston as an aero-engine designer. This employment too was short lived and by mid 1915 it was over. However the experience gained was enough to land him a job with the design team at Westland Aircraft Company (Petters Ltd). This was to last until the end of the war. 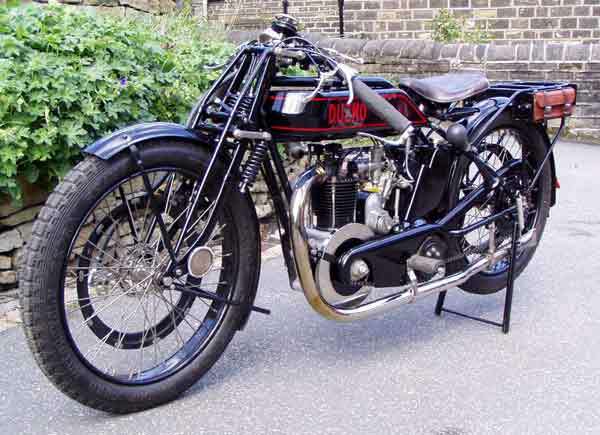 At the latter part of 1918 Wallace began to design a high performance motorcycle engine. He advertised his design in 'The Aeroplane' to any firm wishing to diversify after their war contracts had ended. Such a company was the Portable Tool & Engineering Company of Enfield, who were impressed enough to take on Wallace as Chief Designer. The initial plan was to sell engines to other motorcycle manufacturers. By September 1919 the first engine was ready for trials, it was 88.9mm x 76.2 giving a capacity of 475cc. Duzmo Based Biggs 1922 Special, using a modified 1921 engine. It was at this point that Wallace's friendship with Bert Le Vack was renewed. Bert's war time experience of assembling and testing aero engines would be ideal for the fledgling company, so his services were secured for a modest salary. Le Vack proved to be a valuable asset, with his ability to produce wonderful results from ill fitting components. Bert was quickly put to good use, he built the first prototype engine and got it running satisfactorily. Next he built the second engine and fitted it into a complete motorcycle. This machine was used by Le Vack in competition and in demonstrations to the trade & public. 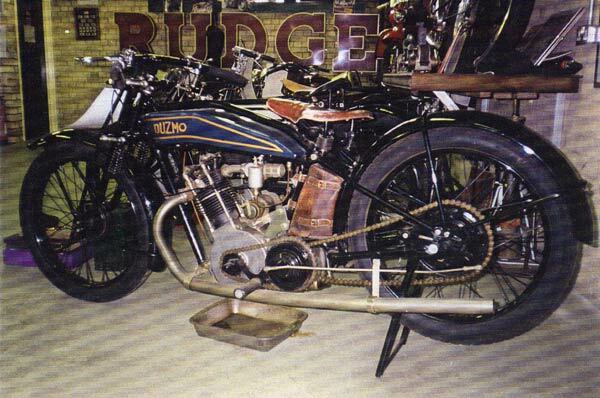 An example of a Duzmo motorcycle with pre 1922 engine, now owned by Tim Walker. The same machine taken from the near side. The combination of Wallace's design skills and Le Vacks development & Riding skills produced an excellent machine. 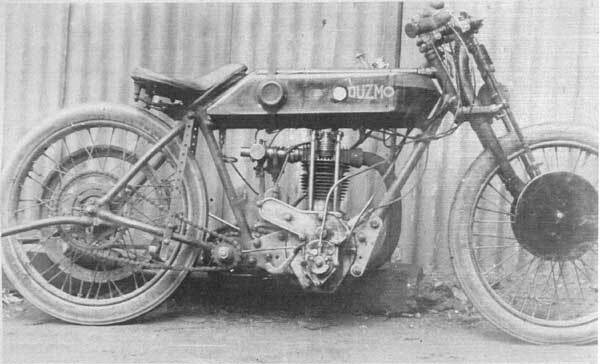 It was christened the 'Ace', then became the 'Buzmo', before ending up as the 'Duzmo' in 1920 when Le Vack became well known in the racing scene. The success initially produced an order book far greater than production could cope with and also bought Le Vack to the attention of much larger and wealthier organisations. By 1922 Le Vack was on his way to J.A. Prestwich in a deal that Wallace could not complete with. The initial concept of selling engines was soon superseded as a result of the vast majority of orders being for Le Vack replicas. It was decided the way forward would be to float the company, so the order book could be fulfilled. However the Portable Tool directors failed to do so and decided to wind up the company. This hit Wallace hard, but the blow was softened by one of the directors. He suggested that Wallace should take over the company and the money was made available by the same director. The loan was to be repaid from future profits. 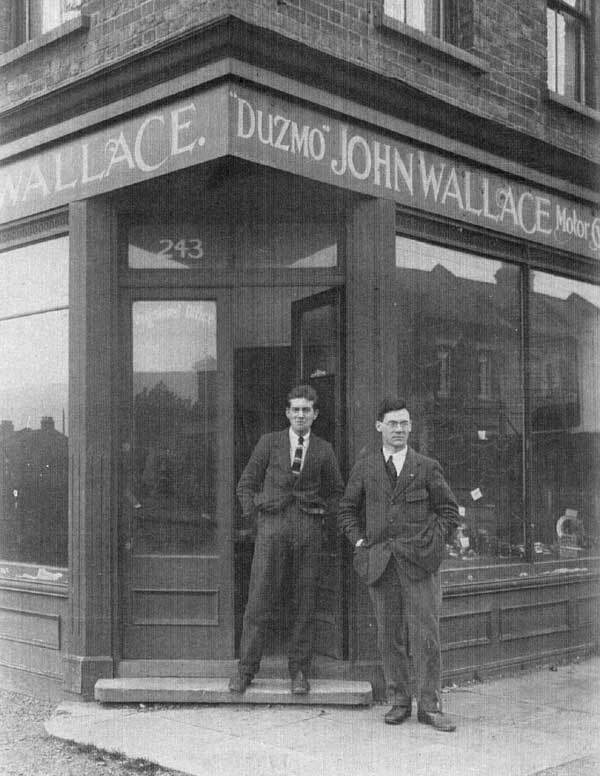 Wallace agreed and from then on the Duzmo machines were built by the new company trading under the name of John Wallace. 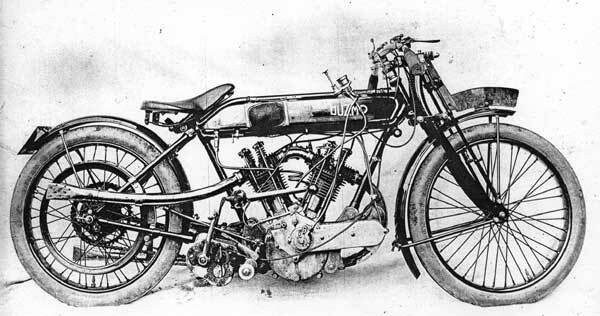 The production Duzmo from 1920 was belt drive with an engine of 496cc. The engines were produced under contract by The Advance Motor Manufacturing Co. of Northampton, who drew on their own pre 1912 engine production experience. 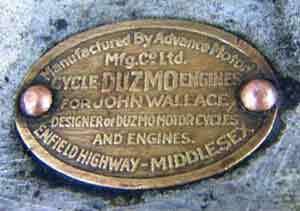 The brass engine plate in the photo cleary states that Advance made the engines for Duzmo. 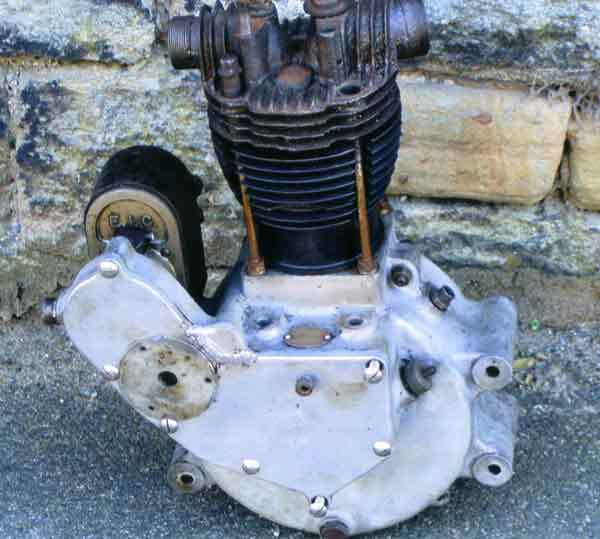 Post 1922 Duzmo Engine complete with Advance brass engine plate. The machine developed through 1921 and 1922 saw the introduction of a Sturmey Archer gearbox and all chain drive. The 496cc engine was doubled to produce the 992cc V twin. It was fitted with a sidecar and took part in the Brooklands 200 mile Sidecar race. 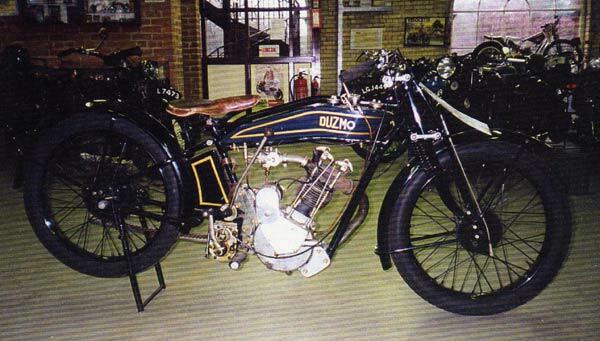 1000cc Vee Twin Duzmo, built to race at Brooklands. This was to be one of the last races by Le Vack for Duzmo, after which Wallace took over the role. However Wallace's talent as a designer did not spill over into being a mechanic and rider. As hard as he might try he could not match the achievements of Le Vack. The lack of track success and the decline in the economy, all contributed towards orders drying up in 1922. For 1923 Wallace designed his last Duzmo. It featured an inclined engine, 'banana' tank and a low seating position. Unfortunately only one was ever built before Wallace went bust. The remaining stock was sold to D.J. Sheppards who attempted to remarket the Duzmo, but it is not thought any motorcycles were sold. Production machine from 1923, engine now inclined. One of these 'bankrupt' stock machines is featured below and is on display at The Whitewebbs Museum in Enfield. 1923 'D.J. Sheppard' Duzmo at the Whitewebbs Museum. 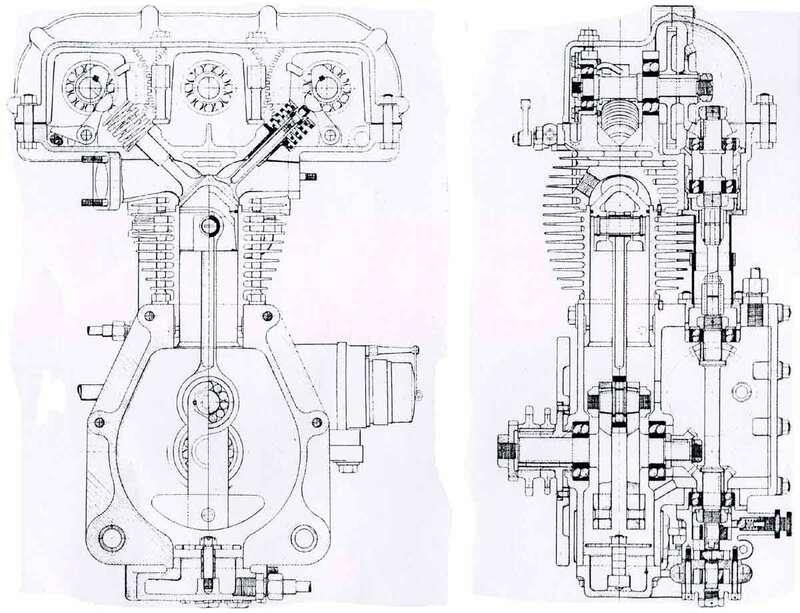 Wallace never worked again in the motorcycle industry again, but he did design a single cylinder overhead cam engine, however it was never built. In addition designed a straight-eight two stroke and a seven cylinder radial engine. John Wallace's DOHC design which was never built. He went on to write papers on the phenomenon of 'wheel wobble' and lectured on the use of multi-cylinder engines in motorcycles. Finally Wallace designed a small tandem cycle-car, which was narrow enough to go through a standard doorway. None of these project attracted backers, but fortunately by then he was a design draughtsman at D. Napier & Sons (of aero engine fame). By his retirement in the sixties he was chief test plant engineer. John Wallace finally died in 1983 aged 87. There is much more to be uploaded on Duzmo. Please get in touch if you can add anything or if you think you may have a Duzmo, any parts or literature.